Meat Racks are the ideal solution for storage and/or transport of theatrical lighting fixtures. Meat racks are the most common product for this application. The challenge with meat racks is that they are large and bulky and thus costly to ship. 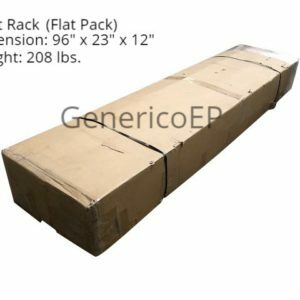 Generico has developed a Flat Pack style of Meat Rack that takes up about 1/8 of the truck space an assembled unit requires and multiple meat racks can ship on a single pallet. Assembly is required and generally requires two people with set of wrenches and a ratchet set. Although time consuming to assemble, the savings in shipping is generally worth the effort. Units can be pre-assembled and shipped complete upon request for a nominal additional fee. Generico meat racks are adjustable and able to adapt to holding numerous sizes of lighting fixtures or the industry standard six (6) lamp socapex bar. 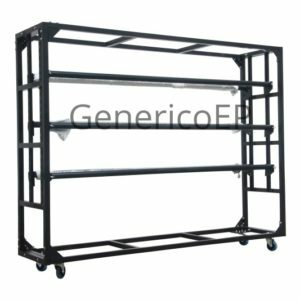 Generico Meat Racks can also be adapted to hold scenic items, certain speakers, and just about any other materials that need an enclosed dolly frame. Generico can custom fabricate meat racks of any size or configuration with a 6 to 8 week lead time and a minimum of six units.